Presenting the Bond House in Camps Bay by Stefan Antoni. Bond House in Camps Bay is a modern luxury villa in Cape Town, South Africa envisioned by outstanding architect Stefan Antoni. The simple but sophisticated holiday venue has fascinating features with open spaces and transparent living areas. Keep reading, you will understand why in 2009 the Bond House was given the House of the Year Award by House & Leisure. This luxury Camps Bay Villa was built by way of Stefan Antoni’s creative vision. It is a contemporary residence on a spectacular terrain in Cape Town, South Africa with transparent living spaces and a 270-degree panorama of the Lions Head, Camps Bay as well as the Atlantic Ocean. Fascinating and simply elegant with a clean arrangement, you will be amazed. Set your eyes on this unique abode that lets you observe the beauty of nature from the spacious lounge. 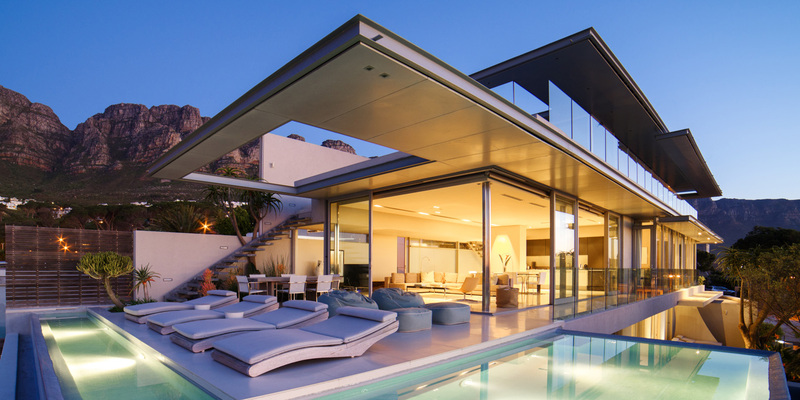 The outdoor and indoor living areas seemingly connected because of the transparent partitions. Its open floor plan gives a sense of continuity that you can freely move from one place to the other, uncluttered that the smallest details are also emphasized. One of the benefits of having a luxury villa designed with an open floor plan is that it fosters togetherness among family and friends. Here’s the really great part... the combined living spaces such as the lounge and dining areas lets you and those you hold dear have shared memorable experiences while on your holiday getaway in Cape Town, South Africa. The Bond House is one of the Cape Town Villas designed by Antoni with a unique feature, the stunning skylight. Imagine how the blue heavens transform after dark. And as the sun sets it is dramatically covered by starlit skies at night. The magical colours and wonders of nature present in this terrific home in this region in South Africa. The Bond House’s casual ambiance is ideal for get-togethers such as Intimate gatherings with those you love the most. Spend the holidays as well as special occasions at this luxury villa. What’s more it has a home automation system that allows you to control the satellite TV as well as audio and video, the security, lighting, air conditioning and heating. The Bond House ground floor dining area is chic in the shade of white. It has a monochromatic motif that features a polished look that perfectly suits the tranquil environment. It is designed to diminish boundaries so as to provide connection from the indoors to the outdoors. Here’s the really great part…the beach is just a four minute walk from the luxury villa. The seating areas as well as sun loungers at the Bound House offer you and your guests the utmost comfort. Living areas with minimalist furniture and fixtures in various corners of the property enhances the villa’s sleek and contemporary design. Eliminating doorways and opting for wide passages in the different sections of the home also gives you freedom of movement. All bedrooms include en suite bathrooms. The monochromatic motif with an open floor plan and minimalist design gives it a classic but contemporary aesthetic. The soothing ambiance helps you fall asleep as the glass door is opened, inviting the cool breeze to come in. You can get a glimpse of the amazing view before you settle down for the night. The view observed from the rim-flow lap pool at the Bond House is comparable to none. Enjoy the exceptional landscape from the majestic mountains, the town, and the lush garden. By the pool is a raised timber deck area where you can sun bathe. This place allows you to relax and unwind so you better make the most of it. 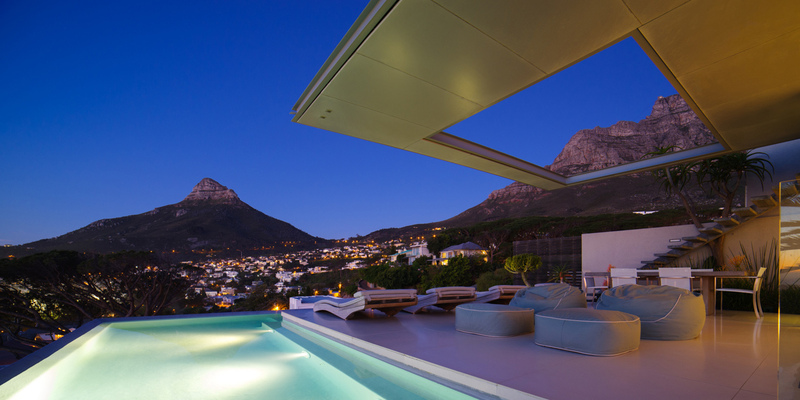 The Bond House is a fantastic luxury villa in Camps Bay. There is a cantilever staircase on the left side of the contemporary residence. This leads you to the first floor, brilliantly designed that it appears to be floating in mid air. Make no mistake about it, you will have the time of your life spending holidays in this villa in Cape Town.